A woman arrested by police looking into saline bags being tampered with at a hospital has been released under investigation. 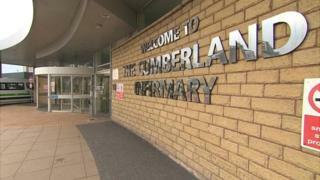 The bags were found at the Cumberland Infirmary in Carlisle in January. The 24-year-old member of staff from Wigton had been held on suspicion of attempting to pervert the course of justice and appearing to contaminate goods. North Cumbria University Hospitals Trust said no patients had been harmed. Officers would "continue to work closely" with the trust and asked anyone with information to contact the force, Cumbria Police said. What are saline bags used for? Saline bags contain solutions of sterile water and small amounts of salt. They are used for a wide variety of purposes in hospitals, such as supplying fluids to rehydrate patients unable to keep water down. Sometimes medicines are injected into the bags so they can be fed directly into a patient's bloodstream.